Mr Moishe Rabi the father of Meir Rabi was a friend of my late father z”l. He once complained about his sons activities in bringing down the level of accepted practices in Kashrus. Mr Moishe Rabi said I told Meir he would do much better B’Gashmius and B’Rochniyus using his exceptional talents in being able to always justify himself and should become a lawyer. 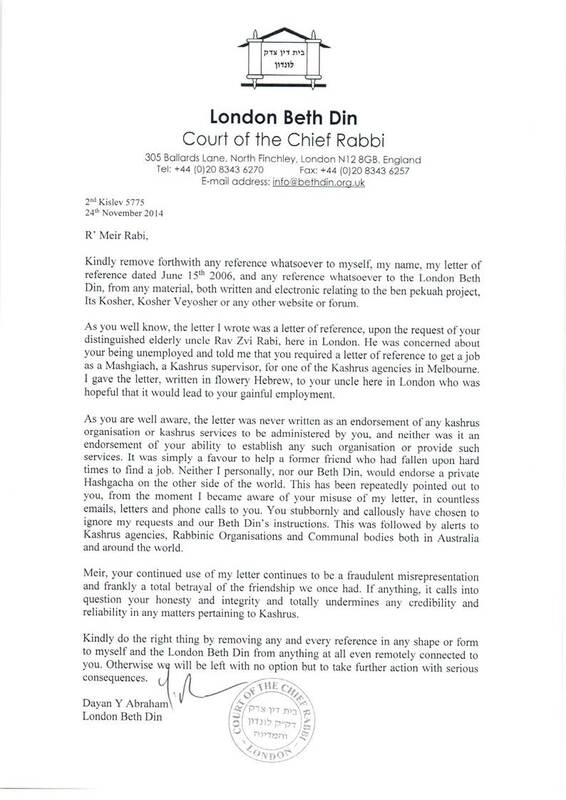 that this has nothing to do with the company as they are not displaying the London Beis Din letter of approbation. In fact, the company brochure, which the 5TJT has now gotten hold of displays the London Beis Din letter prominently. I have no doubt that if Mr Bloch said this, he believed it to be true. But if so, that raises fundamental questions about the management of the company. Who is running the show? do you have the R Schachter material to hand that you could post?